The 10 Best Summer Activities in Arkansas! Summertime in Arkansas has a reputation for picture-perfect weather and community-minded events. Don’t let the dog days keep you from enjoying some of the great summer activities planned throughout the Natural State. Here are 10 activities that we think are the best! One of the most popular summer spots in Arkansas is the Buffalo National River, a river so special that in 1972 Congress named it America’s first national river. The Buffalo Outdoor Center is located in Ponca, aka the middle of nowhere, but this seclusion is part of what makes this spot so great. From family adventures to corporate retreats, the folks at BOC have the experience needed to help you plan the perfect summer getaway. Don’t let your summertime Saturdays pass by without experiencing this outdoor musical series at Crystal Bridges. Each weekend the impressive exhibit Chihuly: In the Forest is transformed into a magical woodland with live music, artmaking, food, games, and more. Chihuly Saturday Nights is held every Saturday night (6-10 p.m.) from June 3 to August 12 at Crystal Bridges Museum of American Art in Bentonville. This popular summer activity is well-known to be one of the best outdoor rodeos not just in Arkansas, but in the entire nation as well. In 1944, when World War II was at its peak, founder Shorty Parsons led a group of Springdale men and women in establishing the iconic Rodeo of the Ozarks. This rodeo of rodeos is held annually at Parsons Stadium, located at the corner of Highway 265 and Emma Avenue in downtown Springdale. This free outdoor movie series was designed to bring the Central Arkansas community together. Every Wednesday from June 7 to July 26, Movies in the Park presents family-friendly movies that begin at dark. Movies in the Park is held at the First Security Amphitheater in Little Rock’s Riverfront Park. 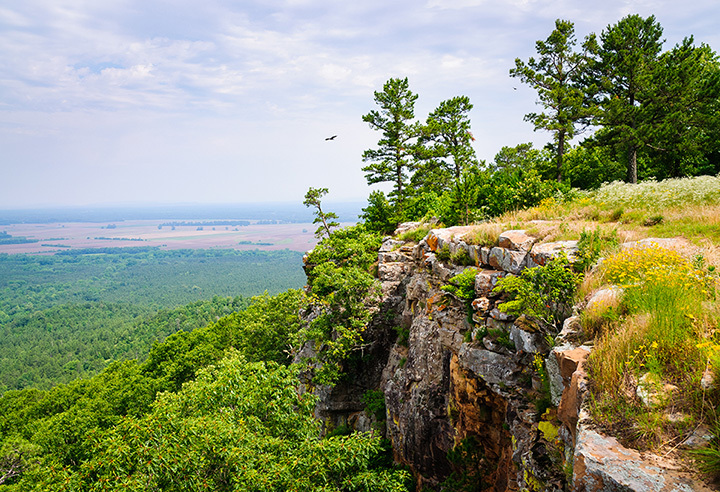 The ancient geology and the natural beauty of the legendary Petit Jean Mountain, situated between the Ozarks and the Ouachitas, prompted the creation of Arkansas’s first state park. During the month of June, the interpretive staff at Petit Jean State Park offers a variety of activities that focus on the great outdoors. Participants of this free summer activity will enjoy guided trail hikes, hands-on activities, nature games, and more. Hosted by Deadhead Productions, this popular event is a freedom celebration that takes place in the beautiful Ozark Mountains. Highberry is a Grateful Dead oriented music festival that is held annually at The Farm Campground & Events in historic Eureka Springs, Arkansas. In case of a burn ban, all fires at the festival will be restricted. In other words, have a Plan B in case you can’t use your barbecue grill. Magic Springs is what happens when thrilling amusement and heat-quenching water are combined into one amazing theme park. Each summer Magic Springs is flooded with guests enjoying everything from thrill rides on the Arkansas Twister, the park’s signature roller coaster, to relaxing journeys on the Kodiak Canyon Adventure River. For the ultimate park experience, Magic Springs also features special events and offers like season passes, group discounts, cabana rentals, and signature dining venues. Wye Mountain Berries is a small but well-known, eight-acre berry farm that is wildly popular in the Central Arkansas area. Visitors have long-enjoyed picking (and eating!) the ripe and juicy raspberries, blackberries, and blueberries that are grown here. Be sure to check out Wye Mountain Flowers while you’re there. DeGray Lake Resort State Park is the only resort state park in Arkansas. Not only is this spot a paradise for fishing and water sports, but it also features a golf resort with an 18-hole championship golf course. If that doesn’t float your boat, DeGray Lake is also a popular spot for hiking, horseback riding, camping, disc golf, and much more. Who would’ve thought that Arkansas’s original state capitol building would have so many summer activities to offer? From the newest exhibits like the Cabinet of Curiosities to the oldest traditions like the Miss Arkansas Gown Exhibit, the Old State House is an interesting adventure for Arkansans of all ages!